Senior Hamas official admits that the "March of the Return" protests are intended to cause heavy international pressure on Israel. 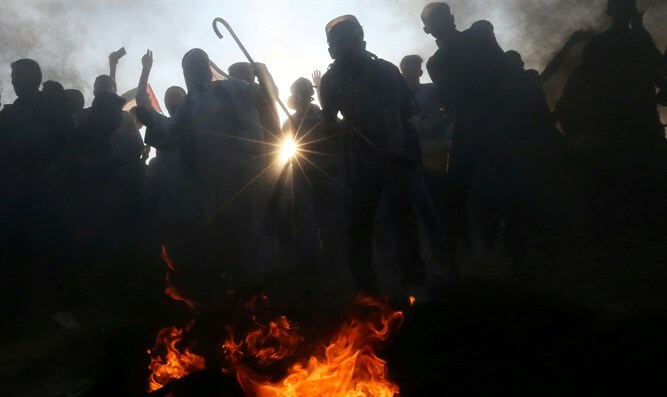 Taher al-Nunu, a media advisor to Hamas leader Ismail Haniyeh, said on Sunday that the riots near the Gaza border fence, dubbed "The March of the Return," would continue until their goal of lifting the siege on the "Palestinian people" is achieved. In an interview with the Hamas newspaper Felesteen, Nunu said that the return marches began as mass events and would continue in the same method "so that the world will see that there are a people under occupation who demand their rights using popular methods, and how the occupation responds by violence and terror." Nunu also noted that the number of participants in the border riots is growing and added that he expects that the world will ultimately be convinced that the "Palestinian people" will fight to the end until Israel surrenders to their demands. At the same time, he added, the political and diplomatic pressures on Israel will continue. Regarding the possibility of a new ceasefire, Nunu said that Hamas' goal is to end the “siege” on the "Palestinian people" without the Palestinians being required to pay any political price, neither now nor in the future.